Cambridge Dictionary defines "adding insult to injury" as a feeling "that someone has made a bad situation worse by doing something else to upset you." The Boston Celtics, however, would define that sentiment more literally. 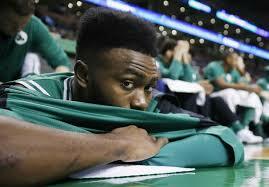 Piling on to an incredibly disappointing .500 start (10-10) to the season, our beloved Celtics will now be without the services of one of our young guns: third-year, highly-promising forward Jaylen Brown has been ruled out for tonight's contest against the Pelicans in New Orleans. Jaylen Brown has been diagnosed with a right lower back bruise and is doubtful for tomorrow night against New Orleans. Terry Rozier (left knee soreness) is listed as probable. Since this tweet, Brown was downgraded and, as mentioned, will be out. On the dark side, superstar Swiss Army knife (and pretty please let him be a future Celtic) Anthony Davis is expected to play tonight after missing the Pelicans last game with a strained right hip. AD will play. Jaylen will not. Cue the sarcastic cheer. Head Coach Brad Stevens on Jaylen's recovery. While the Celtics will be without their resident chess master, all-star Gordon Hayward will return after missing one game resting his sore ankle. Will Jaylen's absence open things up for the forward log jam the Celtics have, much like it did last year when Hayward was out? More importantly, will the Celtics show their grit for 48-minutes and walk out of the Smoothie King Center with a much-needed victory? Let us know in the comments below.